Clearly, setting a story within established continuity and actually contradicting it means that the resolution has to put things back exactly as they were. The release of CO's Reaper was a very convenient and established way of ensuring that would happen. This episode gives us the chance to revisit that last moment of Doomsday as the Doctor and Rose are forced apart again for the good of the universe- except this time the Doctor takes the opportunity to say what he needed to say- not that either of them will remember. The scenes in the lab were shot in October. 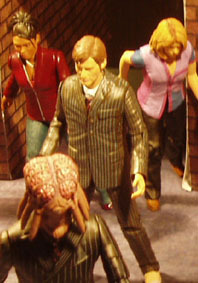 The end scene with the Master arriving on Earth was shot on 30 Nov. The street scenes with the Reapers and the sewer scenes were shot much later on April 10th. The edit took place on the 19th-22nd April and includes music from Doomsday. The decision to include the 'coming soon' trailer was made at the very last minute. See below for the trailer in isolation. 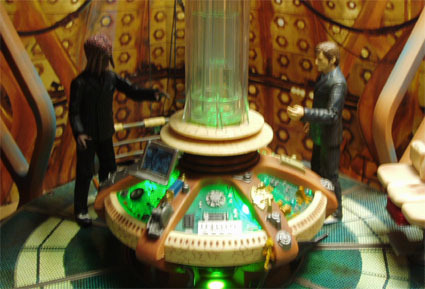 The opening of the TARDIS console is taken from The Parting of the Ways where Rose absorbs the Time Vortex. The Doctor mentions in Utopia that if a Time Lord did that he'd become a vengeful god. The opportunity to have the Master/ Sec try it was too hard to resist. The final scene where the Master lands is intended to follow Utopia where the Master becomes Harold Saxon. From next month we return to comic strip style stories. The trailer includes images from several stories that have been made and hints at some to come- most notably adventures that we have planned for the three upcoming classic Doctors. The quotes from each Doctor are from the PC game Destiny of the Doctors. I'm not that happy with the Davison quote but it's the best I could find.